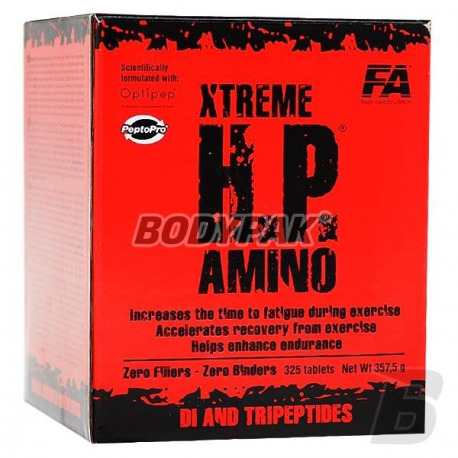 Amino AcidsFA Nutrition Xtreme HP Amino - 325 tabl. FA Nutrition Xtreme HP Amino - 325 tabl. The unique combination of two types of high-quality protein - hydrolysed whey protein isolate and casein hydrolyzate, in tablet form. Bet on the original product with a proven effect! Xtreme Amino H.P.® FA is the most powerful protein formula in the form of tablets, based on hydrolyzed whey protein isolate and unique PeptoPro®. FA H.P.® Xtreme Amino is a premium blend of protein available on the market characterized by extremely high biological value. Highest quality FA H.P.® Xtreme Amino is provided by adding PeptoPro®, pre-digested casein derived from milk. 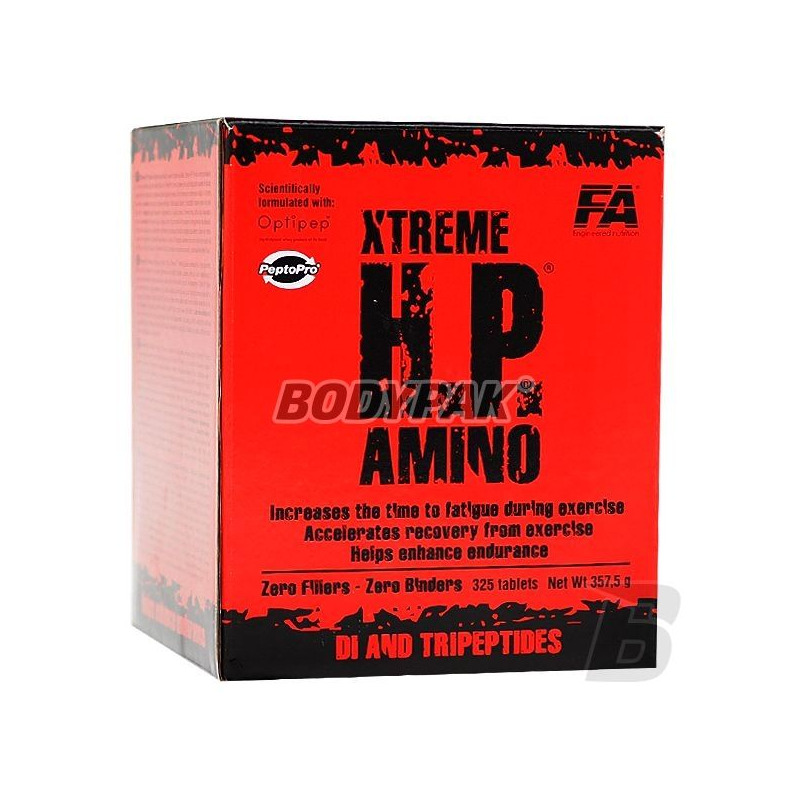 FA Xtreme H.P.® Amino contains no filler so provided all amino acids from hydrolysates are rapidly absorbed into the bloodstream and provide the substrate for muscle building. It is well known that amino acids are the building blocks of proteins, which are essential for the functioning of muscles. Proper and prompt delivery of amino acids allows the body to increase protein synthesis and decrease muscle catabolism. Each serving FA Xtreme H.P.® Amino optimum dose easy to assimilate di peptides, tri-peptides and amino acids, which provide a positive nitrogen balance during and after exercise. In addition, the FA Xtreme H.P.® Amino eaten immediately after the workout strengthens the body's immunity and stimulates muscle recovery after intense exercise. FA Xtreme Amino H.P.® is the best source of amino acids in tablets with all kinds of protein supplements available in the market. It is particularly recommended for professional athletes and active people who want optimum condition muscles and rapid adaptation to high loads and intense workouts. FAST RECOVERY, BETTER increases - ALL THIS AND MORE WITH FA XTREME H. P.! Consume after 3 tablets three times a day, 30 minutes before and immediately after a workout in the evening. Consume after 3 tablets three times a day, morning, afternoon and evening. Suplement zgodny z opisem producenta - lepsza regeneracja i bardziej odczuwalne przyrosty czystej masy mięśniowej! Trec Taurine 900 - 60 kaps.